Deep in the heart of Texas is an area called the hill country, and deep in the heart of the hill country is Comfort, Texas. I have an affinity for this part of the country so I was very interested in checking out this candle company. Comfort Candle Co. has a pretty and simple website. It’s got product information and purchase options with little fanfare. Fragrance descriptions are not linked from the main page but are provided in each of the product sub-menus. Cylinder jar candles are available in three sizes along with travel tins and fragrance oils. The ordering process is easy. Shipping charges are clear and free shipping is offered on orders totally over $100. I found Comfort Candle Co.’s straightforward website refreshing. The colors and photos are soothing too. My Comfort Candle Co. candles arrived quickly. They were well packaged and cushioned with bubble wrap. My package included a beautiful brochure that included an introduction to Comfort Candle Co. and listed all of the scents offered with descriptions. The 12 oz glass containers are cylindrical status style jars with well fitting glass lids. All three candles have natural colored soy wax and single cotton wicks. Each candle has a round Comfort Candle Co. label with a sleek tree logo and the scent name prominently displayed. The labels are handsome but I would have preferred them on the lid so I could see more of the pretty candlelight. How did my candles smell? 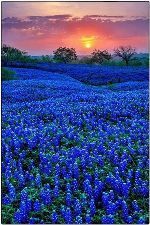 Bluebonnets are synonymous with the Texas hill country in spring. These beauties blanket hillsides and roadways with color each spring. It is a spectacular sight and a distinct floral fragrance. My candle from Comfort Candle Co. smelled exactly the way I had hoped. It smelled velvety with not even a smidge of sweetness…just flower petals, green stems and fresh air. This scent was lovely and fresh for spring. I burned this candle in a smaller room. It was a lighter throwing but well balanced fragrance. I’ve smelled similar fragrances before under different names with various degrees of success. When done right, it’s a fabulous, crowd pleasing scent and Comfort Candle Co. has done it right. The sweet strawberry and pomegranate complement each other perfectly! The vanilla tames the sweetness and gives Divine its “Mmmm” factor. This blend matched exactly what I hoped and expected to smell, so I was nose-happy. My only wish? If I could snap my fingers and make this one a little bit stronger, I’d do it. I wanted my whole home to smell Divine. This scent reminded me of those sweet roasted nuts that street vendors sell. Hill Country Home is a toasty warm, nutty sniff with rich sweet maple and I think a sprinkle of cinnamon or nutmeg perhaps. I really liked this one. It was very inviting and just perfect in my kitchen all day. I found this fragrance to be the strongest of the three I tried. 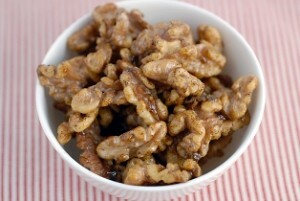 It made my kitchen smell wonderful! These soy blend candles burned very well. I trimmed the wicks between burn sessions and that was the only required maintenance. The flames stayed strong and in control. I got a decent melt pool from edge to edge on all three of these jars and the wax melted slowly. These 12 ounce candles boast an 80-85 hour burn time. I liked how my candles lasted a good, long time and seemed to burn a bit cooler than some other brands. With three different sizes of candles and almost 40 fragrances, there are plenty of products to explore at Comfort Candle Co. The three scents that I tried all reminded me of the comfort and ease of Texas hill country. Shipping was fast. Customer service was outstanding. Definitely give this company a try for some authentic Texas comfort. 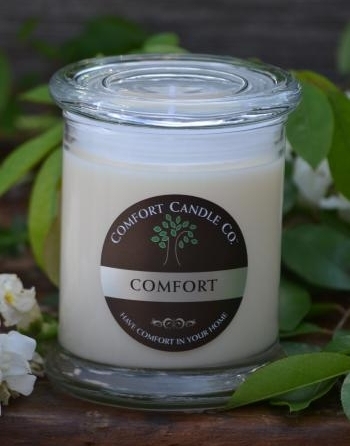 Have you tried candles from Comfort Candle Co? Review them with Julia. It’s easy… simply write your review and star rate your experience in the comment section below. Julia reviewed the fragrances Bluebonnet, Divine, and Hill Country Home. great review. i think the hill country home would be my favorite out of the three as well. and i agree with your thoughts on the label being on the lid (or a tad smaller even).